Daytime Swordfishing in Fort Lauderdale OFF THE CHAIN! There are some monster fish biting offshore of Fort Lauderdale this week. Our daytime swordfish trip caught an almost 300 pound swordfish deep dropping in 1400 ft of water about 15 miles offshore. I’ve been getting fishing reports from some captains that I know were that the swordfish bite is getting hot. So with a group that wanted to catch a monster billfish, we went offshore and did some daytime swordfish dropping. The trip started off slow for us. We made about 6 drops without a bite and we were starting to get discouraged. On the radio, we heard a lot of other swordfish boats getting hookups and catching some decent sized ones. The seventh drop was our lucky number. We must have dropped it right on his head because we came tight on the fish as soon as we hit the bottom. This swordfish fought like a beast. Over an hour and a half long fight to catch this fish, but oh what a nice one. We estimated the fish at weighing about 300 pounds. We’ll be eating this for a long time! Several other boats caught nice swordfish out there on the same day, but I’m sure our’s was the biggest. There are a lot of swordfish moving through our waters this time of year. Monster thresher shark caught at night- the glowing spot in the pic is his eye. His eye is the size of a softball. There are some monster exotic sharks biting out there. 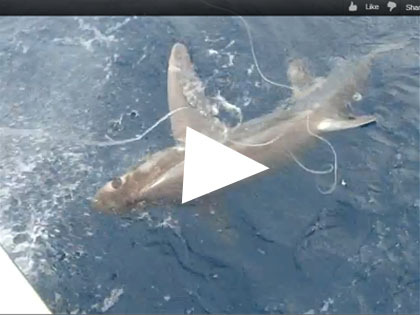 This week, 3 big eye thresher sharks were caught on our charters. Thresher sharks are very rare sharks and big eye thresher sharks are even more rare. Not many people can say they have caught a big eye thresher shark. This is a great photo of one caught on a night shark fishing trip. The glowing spot in the photo is the thresher shark’s huge eye. It’s the size of a softball. The video below is and awesome clip of us releasing a big thresher next to the boat, filmed just a couple days ago. There are some monster fish biting off Fort Lauderdale.